A group of students works through a challenge on the low ropes course, one of the first modules they experience as part of the Kapnick leadership Development Initiative. I know: it’s a strange problem to have at the beginning of law school, but the Kapnick Leadership Development Initiative was always meant to challenge us in new ways. And I was certainly challenged. 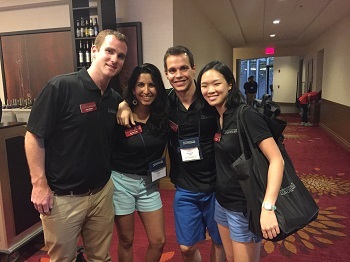 I was part of the first Law School class to participate in Kapnick—and, two years later, I was part of the first class of Kapnick facilitators to have experienced the program as a 1L. Before coming to law school, I had participated in a low ropes course like the one we visited at the beginning of the roughly two-week program, and I’d even helped guide others through them. But this time, as a new 1L surrounded by new faces, I had no idea what to do. Somehow we needed to crowd onto that platform, but so many ideas were being tossed around—small people in the middle with everyone else squeezing on the outside, students piggybacking on other students, and various other support scenarios intended to minimize the amount of space each person took up. I wondered: How would we succeed? In the end, we figured it out by learning to work as a group: the two smallest hugged in the center to act as an anchor, while the rest of our group held hands and balanced on one foot. After rapidly singing through the lines, we separated and gave each other real hugs. Two years later, as a facilitator, I watched a new group of 1Ls going through the same thought processes and testing out the same ideas, but singing “Happy Birthday to You” in honor of a classmate’s birthday. And while observing them—and occasionally asking questions to help them think about strategies, just as my facilitator had done for us—I thought to myself that this could be their moment to remember, as one of many Kapnick experiences. Kapnick has taught me many things, but in particular, Kapnick taught me that there are many different ways to be a leader, and even more ways to be a good leader. As a 1L, Kapnick taught me the theories—the importance of action skills (sometimes termed soft skills), the significance of different perspectives, and the ways to approach different group roles. In the box activity, there were leaders who suggested ideas and leaders who tested them and refined them. As a 3L facilitator, there were also leaders who observed and strengthened discussions by asking additional questions. As a facilitator, Kapnick gave me the opportunity to practice those action skills and teach them to the 1Ls. And though Kapnick is focused on leadership and learning, Kapnick is also an incredible bonding experience and a chance for the facilitators to give back to the Law School and help shape the Law School community. The Kapnick Leadership Development Initiative was created in 2014 as the result of a $2 million joint gift to the Law School and Booth School of Business by Scott, JD/MBA ’85, and Kathleen Kapnick, ’84. Kapnick is based on Booth’s experiential Leadership Effective and Development (LEAD) course, but is tailored to the Law School and law students to help them hone interpersonal skills that are increasingly significant in the professional world. All first-year law students participate in the Kapnick modules, which include personality and leadership, public speaking (Captivate the Audience), practicing self-awareness (Self-Awareness and Building Relationships), and more. As a 1L, Kapnick was just one of many great unknowns. I knew it was a new program designed to teach leadership skills, but I did not know what exactly we would be doing. One of the few things I did know was to arrive at the Law School on Monday morning with a bag packed for an overnight trip. But as I worked through a low ropes course with my Bigelow section and practiced my public speaking skills within my Littlelow (my small group of eight 1L students and one facilitator), I started to appreciate the opportunity we had been given. By tackling challenges on the low ropes course, I learned to trust others, communicate better, listen more, and work collaboratively. By presenting to my Littlelow and watching a playback of my speech, I watched myself unconsciously over-gesture with my hands and realized I could speak a little louder and more slowly when presenting. By taking the Hogan Personality Inventory test and examining the results, I saw that, although I was among the most introverted students in my Bigelow, I already felt comfortable enough to share that fact with them—and to joke about my apparent lack of assertiveness despite my comparatively high score for directness. And throughout all of it, I made friends, bonding with my Littlelow, my Bigelow, and the entire Class of 2017. As a 3L and a member of the first class of facilitators who had participated in Kapnick as 1Ls, the Kapnick experience was very different. For all of us who chose and were chosen to be Kapnick facilitators, each of us had our own reasons for becoming a facilitator. As the president of the Asian Pacific American Law Students Association (APALSA), part of me wanted to be involved with Kapnick because my two predecessors had done the same. I also recognized how important it is to be involved with the 1Ls early on in their Law School careers, as Kapnick helps set the tone for the 1L year. But like many of the other facilitators, I believed that Kapnick helped shape our law school experience and our sense of community. We wanted to be a part of creating that for the next class of students. To prepare ourselves to be facilitators, we spent Spring Quarter of 2L year working with our Booth co-facilitators developing the modules and honing our personal leadership skills through presentations and meetings. We returned to campus in early September and spent two more weeks organizing and prepping for our 1Ls to arrive. And although I remembered how unsure I felt going into Kapnick as a 1L, I was intentionally vague when I was asked questions by my Littlelow—I wanted the 1Ls to maximize their experience trying new things and learning new skills without expectations. The uncertainty, I now understood, had a purpose. Many parts of Kapnick have changed over the years, and many aspects will continue to change. The needs of facilitators and participants will change, as will their approach to Kapnick and to the Law School. The modules of Kapnick continue to be developed and are updated every year. And every year, the facilitators and the Law School attempt to improve on the last. The structure of Kapnick—for instance, whether it is part of orientation or distinct from it—continues to be adjusted. As such, Kapnick may no longer be a 1L’s very first Law School experience, as it was for me. But it is still a very distinct UChicago experience. I am truly glad to have been a part of Kapnick, both as a 1L coming into law school and as a 3L preparing to leave law school for professional life.